The International Congress of Hearing Aid Acousticians and the International Industrial Exhibition together are the world’s largest event for hearing care professionals, which is held annually in Germany. It attracts over 8,000 visitors and more than 140 exhibitors from more than 80 countries, each year. The event is a cooperation project of EUHA (European Union of Hearing Aid Acousticians) and BVHI (German Hearing Aid Industry Association). 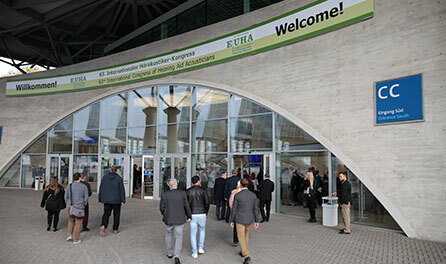 EUHA is the host and organiser of the world’s largest international hearing care congress, and BVHI is the organiser of the industry exhibition. You can find out about the congress programme and register for the EUHA Congress on the EUHA website. Are you interested in submitting a presentation for a lecture at the 64th International Congress of Hearing Aid Acousticians? Please send your input by March 29th . The Congress brochure which provides all you need to know about the event: The Congress brochure will be available from the EUHA from early September 2019. The “EUHA App” including all the relevant information on the Congress is available free for download from the respective stores for smartphone and tablet users. Admission tickets for the Congress Get-together on October 17th, 2019. The services provided by the EUHA must be arranged and settled with the EUHA directly. Your sole contracting partner is the EUHA.